Yola sup dood, hpw r u mang? We're super hyper giga fine! From the previous album, it’s been 364 days and 242nd new album has just been released in total. It’s a web streaming album with the high quality sound of 44.1kHz 16bit that is the same quality as CD. Also, all the tracks that were released in the past are now updated as high quality web steaming album as well. Click "PLAY" for the each track on the album page of JINMO.COM. Just by doing so, you get to enjoy the CD quality tracks right away. There is no need for any dedicated devices, software nor downloading. With iPhones, iPads, or computers, anytime anywhere anybody can enjoy all the tracks of the all works on the spot. 2007 ”Mass”, 2008 ”Melchior”, ”Balthazar”, ”Casper”, 2009 ”amor et mors”, 2010 ”I’m praying”, 2011 ”Incarnatio”, 2012 ”Virgin”, 2013” The Doors of Perception”, 2014 ”Nativity”, 2015 ”The Celebration of Beauty”, 2016 ”Baptismus Sonitus”, 2017 ”Eulogia”, those are the Christmas albums that were released each year. The album of this year contains two tracks. One is 3h and 18min long and another one is the essence version of the first one that is 5min and 7sec long. They sum up to 3h 23min and 7 second long Christmas song as total. Of course, the sounds of the bell heard from a church every year are in them as well. 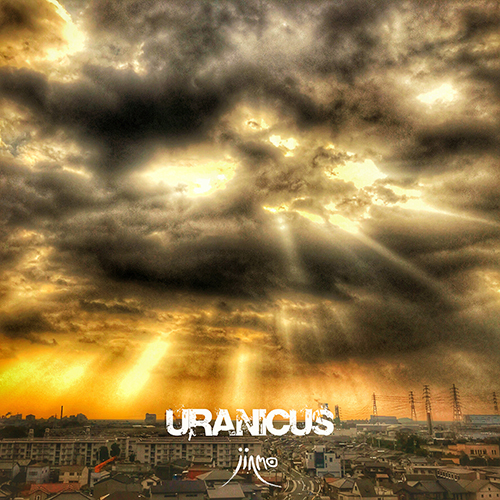 The title “Uranicus” is from Latin and the meaning of it is “heavenly”. The tone cluster of the glossolalia improvisation with clear tone that is as if it were coming in and out repeatedly and the guitar orchestration that is like something made from a mixed chorus and a symphony. The sounds of the church bell that keep going on and on in between. And the binaural beats orchestration that is hyperdense overtone which we got to experience from Jubilus series keep stimulating our auditory sensors from beginning to end. That is over the total audible range and is the full band that includes ultrasonic range, which is the chaos of binaural beats generated from the swirl of the elaborated Tartini tone (combination tone) that is way too complicated to be recognized. There is no repeated tone clusters that are the same during the 3h and 18 minutes, and each of them is all different, which makes it not a simple minimal music. The overall impression is like psycho-acoustic-drone , we could say. The sound is like something emotionally influential one that contains all the emotions and that gives us the feeling of being wrapped in a pleasant intoxication like religious ecstasy so to speak while listening for long. "In the natural world, the sound synthesis of two kinds sounds which frequencies are close to each other is not simply a harmony but it creates the beats with new frequencies that did not exist before. For example, for the synthesis of 500Hz and 510 Hz, the low frequency beats of 505Hz can be generated 10 times per second can happen. This phenomenon happens similarly inside of our brains but in the way of far more interesting condition. When using headphones for both ears and listen to two completely independent sounds for each ear, the low frequency beats that become the third frequency not as a physical phenomenon in the natural world but as a subjective phenomenon inside of our brains are recognized. This phenomenon was discovered by Heinrich Wilhelm Dove in 1839 and was named “Binaural Beats”. Since 1970, that has been catching an attention as the means of synchronous induction of brainwaves and the research about it has been conducted. There are many reports that the experiences of altered state of consciousness have happened such as astral projection." I highly recommend using good quality headphones for listening in order to enjoy the expansion, the depth of the sound world and more than anything, the binaural beats by Tartini tone (combination tone) phenomenon in this work. We often get questions about the monitor headphones that JINMO uses but they are “W4” from Westone and “MDR-CD900ST” from SONY. The photo of the album cover is heavenly rays of the sun that were bursting through the clouds above the Seto Inland Sea taken by JINMO himself on New Year's in 2017. We wish everyone God’s blessings. Now have a merry Christmas!!! This album is highly recommended for guitar lovers of course but also for the ones who like contemporary, ultra modern techno, and experimental music as well. It's been just 364 days since the last album "Eulogia" was released. In total, 242nd solo album (223rd from Avant-attaque) has just been released. It’s a web streaming album with the high quality sound of 44.1kHz 16bit that is the same quality as CD of course. Since December 2016, all the price tags of the all works from Avant-attaque have been taken off based on the intentions of JINMO. Your thoughtfulness and generosity become a big support for JINMO's next productions of his works and his activity in the future. We appreciate your heart big time. Click "PLAY" for each track to listen. With iPhones, iPads, or computers, all the tracks can be played just by streaming on the spot with high quality sound like CD. There is no need for any dedicated devices nor software. On computer, you can download the music files also. Please enjoy the work anytime anywhere in the anyway you would prefer. Also, there are messages from JINMO to you all if you go to the link below. Please just have a read. The works released from Avant-attaque (web streaming version) can be updated by JINMO's intention time to time. The latest versions can be checked from the link below. We ask for your continued support for JINMO who keeps creating more and more vigorously from now on.